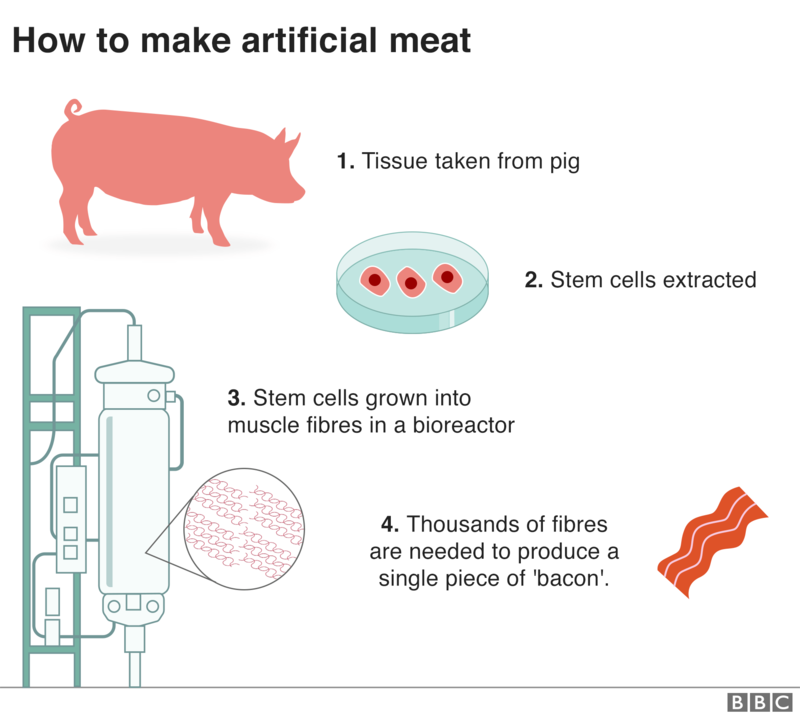 If the process can be reproduced on an industrial scale, meat lovers might one day be tucking into a slaughter-free supply of "bacon". 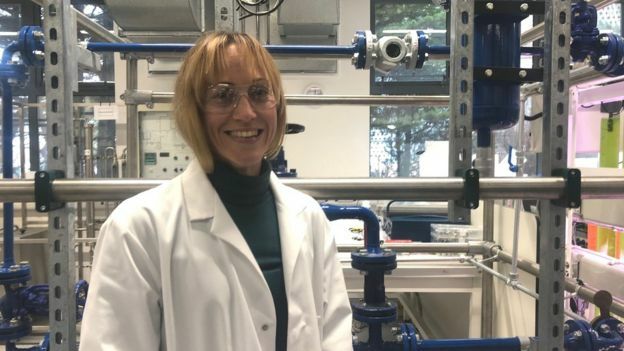 Chemical engineer Dr Marianne Ellis, of the University of Bath, sees cultured meat as "an alternative protein source to feed the world". Cultured pig cells are being grown in her laboratory, which could one day lead to bacon raised entirely off the hoof. "And the pig's still alive and happy and you get lots of bacon at the end." December 2018: A "steak" grown from cells in the lab and not requiring the slaughter of a cow was produced in Israel. It cost $50 for a small thin strip, but, according to its makers, needs perfecting. At Bath, they're experimenting with something that's entirely natural - grass. They're growing rodent cells, which are cheap and easy to use, on scaffolds of grass, as a proof of principle. 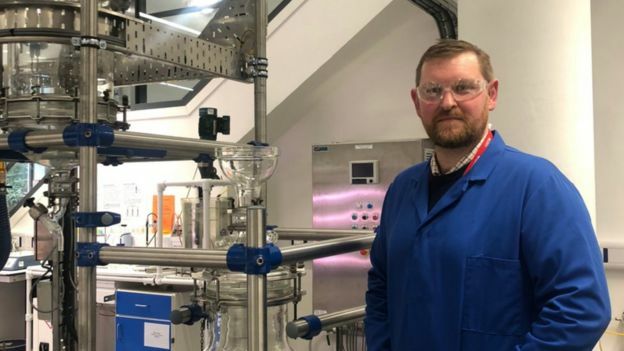 "The idea was to essentially, rather than feeding a cow grass and then us eating the meat - why don't we, in quotation marks, 'feed our cells grass'," says Scott Allan, a postgraduate student in chemical engineering. "We use it as a scaffold for them to grow on - and we then have an edible scaffold that can be incorporated into the final product. The end product would be pure muscle tissue - basically, lean mince, rather than something with the taste and texture of a chop or steak, which means adding fat cells and connective cells to give it "a bit more taste". 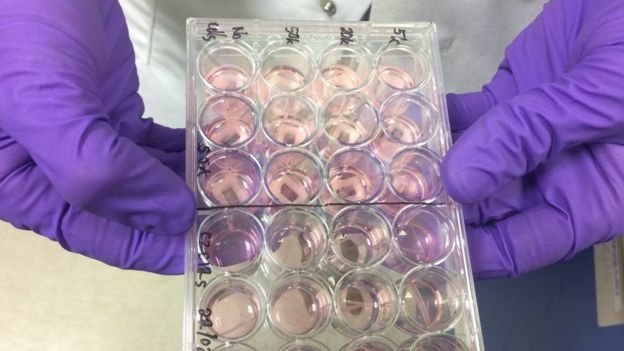 Dr Ellis told the BBC :"What we're doing here is looking to design bioreactors, and the bioprocess around the bioreactors, to grow muscle cells on a large scale that is economical and safe and high quality, so we can supply the muscle cells as cultured meats to as many people as want it," says Dr Ellis. She envisages taking "primary cells" from a living or recently slaughtered animal, or using a population of "immortalised" cells, that will keep on dividing. "Which means that you don't kill any animals; you have this immortal cell that can be used forever." "It's also a massive commercial opportunity, which companies, universities and governments should seize the opportunity to support and invest in," he argues. One recent study found lab-grown meat could actually be worse for the climate than conventional meat - although the research did not look at water and land use. "Cultured meat might be one of these promising alternatives to reduce agricultural emissions but until we get more production data we can't automatically assume that for the time being," says the author of the paper, John Lynch of the University of Oxford. "In my little farm in West Wales, ideally what I'd like to see is that we kept a range of very, very traditional native breeds of livestock on a very, very small scale to an exceptionally high welfare standard. "The by-product from their use as a land management tool - whether that's in clearing land or restoring grasslands - would be the harvesting of cells for the culturing of cell-based meats. Lab-grown meat is not expected to be available widely for at least five years. It remains to be seen whether people will want to eat it, but surveys in the UK suggest 20% would eat it, 40% wouldn't and the rest are undecided, with younger generations, urbanites and wealthier people more open to the idea. The third is most difficult to address, he says, based on "the naturalistic fallacy", where people reason that natural things are good and unnatural things are bad.